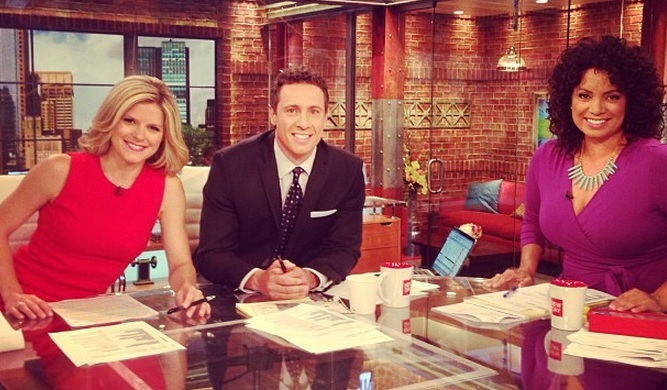 Kate Bolduan, Chris Cuomo and Michaela Pereira on set at "New Day"
How did a dog get stuck up there? Jorge Rodriguez answers questions about his friend George Zimmerman’s response to the not guilty verdict in the death of Trayvon Martin, and whether or not Zimmerman has a history of racism and violence. Rodriguez also discusses Zimmerman’s injuries after the fatal incident with Trayvon Martin. “From knowing George and seeing the injuries, something happened that night where he had to protect his life. In which he did so," says Rodriguez. The royal baby watch in London is driving everyone to distraction. Speculation is running rampant about whether this will be the week the Duchess of Cambridge gives birth to the future King or Queen of England. CNN's Max Foster reports. A 6-year-old boy swallowed whole by a massive sand dune is in critical condition. He was saved by emergency crews that dug him out, CNN's Pamela Brown reports. Authorities say Nathan Woessner was suddenly swallowed by a sinkhole on Friday, June 12th on the Indiana sand dunes lining Lake Michigan. Dozens of first responders rushed to the 11-foot tall mound of sand burying the boy. With excavation equipment in hand, they raced against the clock. "At that point everybody was really frantically, by hand, trying to dig him out. Once I had ahold of his head, I was supporting his head and just talking to him you know, just like I would talk to my own son," says Brad Kreighbaum a Michigan City Firefighter and first responder. More than 3 and a half hours went by, and then finally signs of life. "I kind of felt for a pulse... your heart wants you to feel that and your heart wants you to hear that breath," says Ryan Miller, of D & M Excavating who helped in the rescue. Woessner, unconscious but still breathing, was pulled from the sand and rushed to the hospital. In the end, it may have been a single pocket of air that saved his life. The family says it's a miracle that the boy survived more than 3 hours buried beneath the sand and thanks the first responders who recovered their son, Brown reports. Authorities do not believe the boy suffered brain damage or any life threatening injuries. The first responders who saved his life say they hope to meet him one day.